Book Review A Message for You By Guy Bourdin Reviewed by Christopher J. Johnson Guy Bourdin is a photographer of limited range and repetitive imagination, but also unique vision. His apparent obsessions are constricted in content and tone: dollish models with painted faces, the frame within a frame, light and its reflective qualities. These themes pervade his work, giving his photographs a trademark flavor and creating an arranged world, a Bourdin world. Given these factors, Bourdin is left with a small frame to work within, a formula that is something like that of the mathematician or, better, the sonneteer. A Message For You. Photographs by Guy Bourdin. Steidl Publishing, 2013. Hardbound. 320 pp., illustrated throughout. 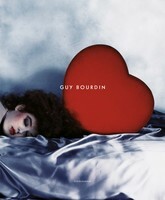 Guy Bourdin is a photographer of limited range and repetitive imagination, but also unique vision. His apparent obsessions are constricted in content and tone: dollish models with painted faces, the frame within a frame, light and its reflective qualities. These themes pervade his work, giving his photographs a trademark flavor and creating an arranged world, a Bourdin world. Given these factors, Bourdin is left with a small frame to work within, a formula that is something like that of the mathematician or, better, the sonneteer. It is easy to form a quick and dismissive opinion of Bourdin's work when first engaging with it. His photographs offer an acute imagination with little peripheral variety. Yet there is a reward found in reengagement with Bourdin. The work has an acquired depth that is very much in line with the 20th century idea of artwork that is aware of itself, often with self-referential puns. Similar effects are found in so much French art of the era: Robbe-Grillet, Godard, and Truffaut come to mind. These artists present subjects encountering the fourth wall in artwork that tries to spill out of its box and into the real world. This aim collapses into its own vacuum, however; there is an intensifying sense of the work being art for art's sake. A Message For You, by Guy Bourdin. Published by Steidl Publishing, 2013. Bourdin's models inhabit this idea as they appear in crumpled photographs of themselves, in blank picture frames and in mirrors. They exist in worlds that remove them from the mimicry of life and into the world inside the photograph. It is always noon in a Bourdin photograph. His models are postured beings: they are lavishly painted mannequins fulfilling the stiffness of their role. Each of his photos is as sculpted and postured as the world in a snow globe. But it is this very stringency that gives them their power. A Bourdin photograph reminds you of the stale and impossible world offered by fashion and pomp and culture. At risk of this reviewer sounding repetitive himself, this is a Steidl book and, therefore, it goes without saying that the book's publication quality is topnotch. The fineness of its paper stock, the soundness of its binding and the range of material provided in the book (whether it is brief memoirs by Bourdin's associates and friends, Bourdin's handwritten notes and conceptual drawings, or alternate takes of photographs and contact sheets) are all of the highest possible quality and interest. A Message For You contains a window into the photographer's artistic process. If a criticism of the book could be made, it might be that all of the plates in the book are delegated to its first half, while all of the supplementary material is located in the latter. Rather than creating a semblance of balance, this creates the feeling of two separate books bound together. A healthy mixture of the plates and supplementary materiel would have reduced the monotonous feel one gets from paging through the first half of A Message For You and the inundation of information provided in its closing half.